Invoice factoring is a financial transaction in which a business sells its invoice to a third party at a discount to collect cash much sooner. Below is a high-level diagram showing the transaction cycle for factoring an invoice. Can my company factor an invoice with Sunway Credit? Currently, Sunway Credit only factors invoices issued to companies that are part of Sunway Group. Invoices must also be approved by the Sunway business unit before Sunway Credit can factor them. If you issue invoices to a company of Sunway Group, you can likely open a factoring account with Sunway Credit. What are the cost and terms? Here is an example of a RM10,000 transaction with 45-day credit terms that is factored with a 90% advance of the invoice's total amount. Opening an account with Sunway Credit requires a few simple steps. This includes submitting the application, and then signing the letter of offer and main agreement. There is a small lawyer fee, which we refund if a certain amount is factored within three months. Once your account is opened, you can start factoring invoices. Note that you can factor individual invoices or batch them together. Within 3 working days, you can get up to 90% of the total invoice amount. 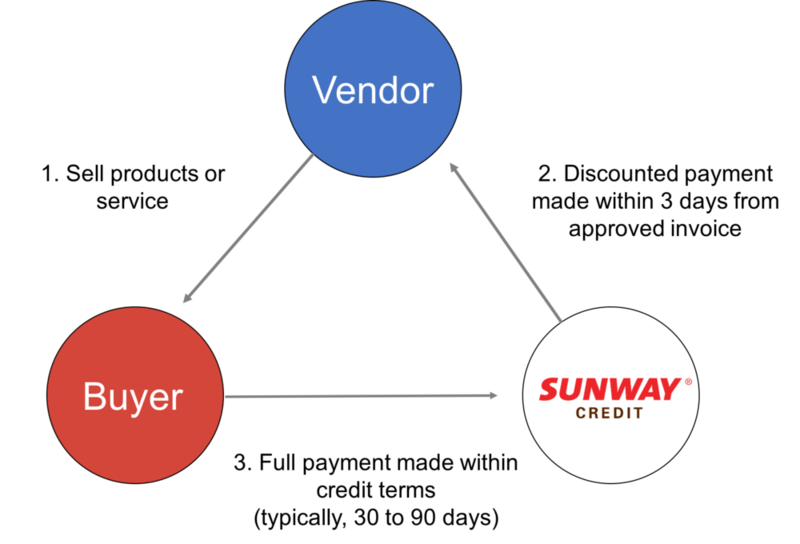 Sunway Credit pays the net balance once it receives payment from the Sunway business unit (original buyer). Just drop us a message here to start opening an account today!